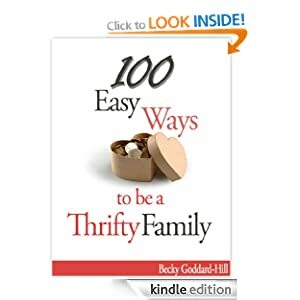 Yesterday I launched a new e-book for everyone wanting to live a more thrifty family life. It is for people wanting to make simple and easy changes to their life to save money. It costs just £2.05 on Kindle but could save you LOTS of money! Did you vow to spend less and manage your money better this year? We all start the New Year with such good intentions don’t we…but we do struggle. Fear not, help is at hand…my new book aims to help you make being frugal as easy as possible. It is a positive and uplifting book and a book from the heart; it is based on my experiences and accumulated knowledge. It is all about community, smart thinking, living well and having a happy and financially healthy family life. From looking good and feeling great to running your car and managing your family’s social life, it will guide you step by step through 100 great ideas towards a less expensive lifestyle. It’s an easy, interesting, informative fun read not a boring dull financial tome and I really hope you enjoy it.